There is something about the deadpan expression on Buster Keaton’s face that belies the physicality and poetry of his comedy. It is the balance of humor and melancholy that gives his work its poignant tension. René Magritte similarly uses the banal neutrality and clarity of a sign painter’s style to render his seemingly simple inversions of logic that amplifies the impact of the discontinuity within his images. In Jeff Colson’s work, he takes the objects of the everyday world – an old patched inner tube, a desk piled impossibly high with stacks of paper, a storage facilities roll-up door stuffed floor to ceiling with the bric-a-brac of the pedestrian world – suitcases, lawn furniture, an old tire, a garden hose, a ping pong table – and makes sculptures, all hand made, carved in wood or cast in other material and painted to make approximations of the original using the ‘wobbly logic’ of memory. It is the space between the original and the facsimile where the entropy of memory begins to breakdown the paradigm. We at first accept wholesale that these are recycled objects, found objects reassembled into installations, then as we approach closer the threshold of perception shifts and we can see that these are handmade replica of the originals, the mind slowly deconstructs the perceived gestalt. Humor and pathos are part of what the fabric of life is made of, as entropy wields its sword, like the hand of time passing through the world, all things will fall to ruin in its path. Humor is a catalyst to help us adapt to the shape shifting nature of the way of all things. Jeff’s sculptures touch upon this conundrum, his replicas are a dime store version of the ‘forms’ whose shadows are cast upon the walls of Plato’s Cave. Jeff has some small tabletop sculptures made of assembled wood; they are made to look like small dwellings, a shack, or a child’s fort. They are first constructed in wood, then Jeff casts them and from the mold makes a replica of the original. They are then painted to look like weathered found pieces of wood. When I asked him about the elaborate process he simply said, ” It is something in my brain, it invests the object with something, I know it is crazy but I have to make it by hand, it can’t be a found object. There is warmth to the ‘invested object’, it almost imperceptibly buzzes with energy. I am not anti-found object as an approach to art, but I find a curious expedience to quickly knocking something out as opposed to relying on what you find.” The tables, dressers and nightstands upon which the sculptures sit – each a reference to different eras – are also made by hand from memory. Jeff speaks about the “invested object”, the quality an objects contains through the intentions and subjectivity that passes from the artists hand into the object. Jeff’s sculptures are not casual conceptual riffs based on some current theoretical zeitgeist, but hard won metaphors where the slippages of what one sees and what one knows are communicated through works that engage the mind and tweak our perceived information with a comedic sleight of hand. Jeff is currently at work on a shelf containing objects both identifiable and ones whose purposeful design makes them look like something we know, but are non-specific fragments of the world, “ I wanted to create forms that looked recognizable but did not signify anything from the world. I want to explore the ambiguity of perception and how the mind identifies objects.” The sculpture appears to be a shelf in a garage with various objects piled on it, the wood planks of the shelf bending under the weight of the objects. The communication of information that is fictional, that there is weight and gravity bending the boards, is part of the humor inherent in Jeff’s sensibility. These slight but thoughtful considerations are the poetic nuances that create the subjective dislocation between what ‘is’ and ‘isn’t’, they coexist in the mind and stir something, the existential quality of absence and presence, of experience and of memory. It is the tension between the eternal present, the light of mind in constant movement forward through time, and inversely, that every experience, moment by moment, becomes a memory. Something in Jeff’s work touches’ upon this tension between now and then, fact and fiction. Years ago I first saw Jeff’s piece ‘Roll up” when I visited him at his studio, the impact was strange. It took a few moments to notice that the objects where generalized versions of themselves, it created a strange inertness to the objects. They took on a quality similar to funerary objects created for Egyptian Pharaohs and Etruscan nobility, signifiers of this worldly life to take on the voyage to the afterlife. There is an odd presence that they evoke, like memory images of the world captured in a banal still life, a theater of mundane objects elevated through art, but given a half-life, rendered in the dimming landscape of memory. 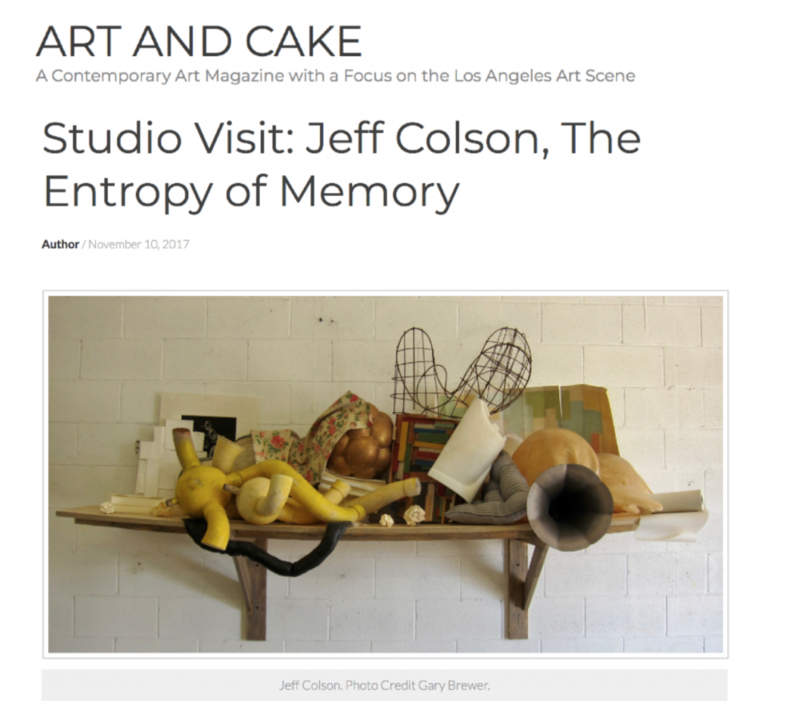 Jeff said that he is at odds with perfectionist idealization in art, that entropy is always at play. He uses the term “corrupted modernism” for some of the ‘paintings’ he creates. They are made of castings of note pads and sheets of paper constructed into flat wall pieces; he paints colors onto them and then paints them out. It is a reference to the ‘maintenance paintings’ one sees on the walls of downtown buildings, where slight variations from the walls colors are used to cover up graffiti, creating unintended modernist abstract painting, the soft oblong rectangles making sidelong glances to Rothko and Hoffman. Jeff Colson’s work exists in a half state, the banality of the shop worn world elevated through Art into a comedic theater of the mundane. Humor is countered with melancholy – pathos is given a ‘ Great Stone Face’ – the quietude of his work is pregnant with anticipation, like objects backstage in a vaudeville theater waiting for their use in a slapstick routine. It is the ‘stasis’ that these sculptures possess that creates a strange classicism clothed in the random objects of world. These imitations of life are metaphoric buttresses against the tidal wave of entropy, the comedic hero holding the door against the howling wind while the rest of the house blows away.